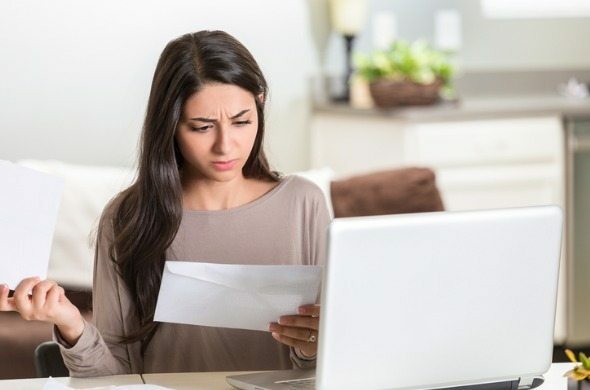 Does it feel like most of your paycheck goes to covering rent? You’re probably not alone. Data from the Census Bureau shows that over 46% of American renters are housing cost-burdened. But the scale of the problem changes depending on where you look. In California over 52% of renters are housing cost-burdened while in North Dakota that figure is just over 36%. The rent problem tends to be at its worst in the big cities. 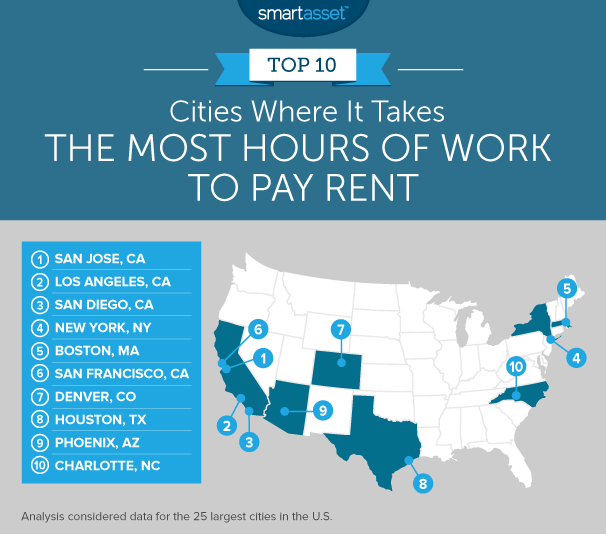 In order to highlight this problem, we looked the data to find the hours of work needed to pay rent in the 25 largest cities in the country. Tip: Make sure you’re allotting enough of your paycheck toward your 401(k). California taxes hurt – With or without income taxes, the top three cities in this ranking would not change. San Jose, Los Angeles and San Diego would still take the top three spots. However, on average, workers in these cities would see incomes increase by about $5 per hour if they were not paying income taxes. That translates to about 17 hours less of work needed to pay rent. San Francisco is hurt worst. They rank sixth after taking out taxes. If we ignored taxes they would rank 12th. Midwest is best – Workers who are renting in the Midwest appear to be getting the best deal. Four of the five cities where you need to work the least hours to pay for rent are all in the Midwest. In cities like Indianapolis, Columbus and Detroit, it takes just over one week of work to pay for rent. The typical worker works about 1,726 hours per year meaning they earn an hourly rate of $21.39. 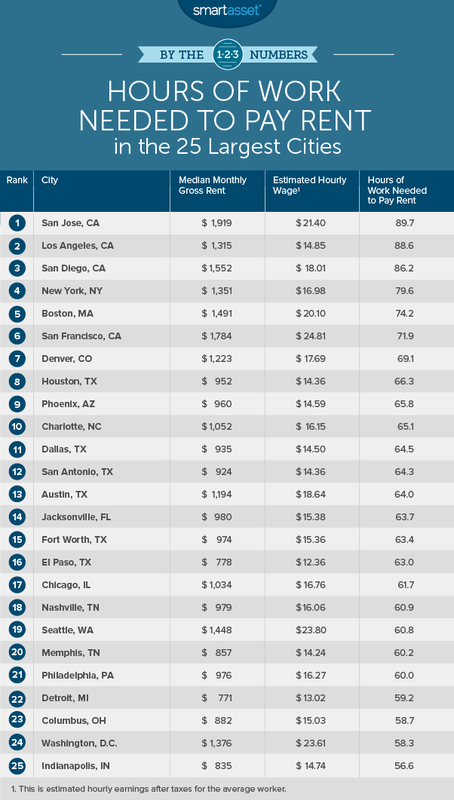 That means covering rent – which in San Jose costs an average of $1,919 – equals roughly 89.7 hours of work. California’s run in the top three continues with San Diego. The average San Diego worker takes home $31,600 after paying taxes. The typical San Diego worker spends about 1,750 hours per year at work, meaning they earn about $18.01 per hour. That’s over $3 more per hour than workers in Los Angeles make. But because average monthly rent in San Diego is about $240 more than it is in Los Angeles, the hours of work needed to pay rent in the two cities end up being pretty similar. The Big Apple takes fourth. Steep state and local taxes take a big bite out of New Yorkers’ paychecks. Despite earning about $800 more before taxes than San Diego workers, on average, New York workers end up taking home about $1,200 less after factoring income taxes. We estimate that a single New Yorker who earns $40,240 (which is the median salary) will pay a total of $9,841 in income taxes. About $1,730 of that will go to the state government while $1,060 will go to the city. Houston workers pay the least in income tax on average, in our top 10. This is due to low average earnings and low income taxes. The Houston average worker earns just over $31,060 per year, and pays no state income tax. Despite Texas’ lack of state income tax and Houston having the lowest rent figures in the top 10, workers still need to put in 66 hours at work to cover rent. The average Houston worker takes home $14.36 per hour after taking taxes into account. It’s a tight race for the last two spots in our top 10. Phoenix, in ninth, is separated from Jacksonville in 14th by less than two hours’ worth of work. Our list ends in Charlotte. As we hinted at in the Phoenix section, it’s a tight race at the bottom. Charlotte edges out 11th-placed Dallas by about half an hour. Charlotte workers earn $28,900 on average after income taxes, which is equal to about $16.15 per hour. To cover rent the average Charlotte worker would need to work just over 65 hours. That’s equivalent to about 1.6 work weeks for the average Charlotte worker. Average hours worked per year. This is the number of weeks worked per year multiplied by the number of hours worked per week. Data comes from the U.S. Census Bureau’s 2016 1-year American Community Survey. Median rent. Data comes from the U.S. Census Bureau’s 1-Year American Community Survey. In order to find out how many hours of work needed to pay rent in each city, we first found the average hourly wage for each worker. To do this, we divided average annual take-home pay by average hours worked per year. We then divided the monthly median rent by the average hourly wage. This gave us the average hours of work needed to pay rent. We then ordered the cities from highest to lowest based on average amount of hours needed to pay rent. One way to lower your monthly rent is to sign a long lease. Typically, leases are signed for one-year periods. By signing a longer lease, say a two-year lease, you can lock in your monthly rate and avoid frequent rent increases. In fact, you may even be able to negotiate a lower rate by offering to stay in a rental unit longer. It costs a landlord money and time to find a new tenant, so by offering to lock yourself in for a longer period you may have some leverage to negotiate for lower monthly rent. When your lease does end and your landlord tries to increase your rent, make sure you are aware of your rights. Different cities have different tenant’s rights laws. If your landlord is raising the rent and you are thinking about moving, don’t forget to factor in moving costs. The cost of moving (and a cheaper rent) may actually be more than the cost of staying in your current home – even with the rent hike. Of course, that is only in the short run, if you are seriously housing cost-burdened you should definitely consider moving, even if the short run costs are steep. Finally, the best way to find affordable housing in a city is to live with roommates. By living with a roommate, you not only split the cost of rent, but also utilities like gas and electricity. Some cities are better than others when it comes to renting with roommates, however, so make sure you do your research.